One of my least favourite genres of book is the caption reader. Do you remember them from school? About as riveting as pond slime and never books I'd choose to read aloud, or listen to. However, caption books have their place, and it's an important one. Most children go through a stage where they need to consolidate the few sight words they know, while slowly adding new ones. Caption readers support little learners who are just emerging as readers. They give them the opportunity to track print from left to right, use picture cues, recognize and read sight words, and self-correct. Recently I discovered a UK company called love2read which changed my mind about caption books. It creates caption books for individuals. 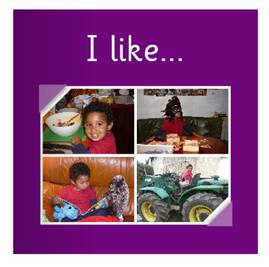 They produce personalised photobooks, designed by we adults for our own kids. How motivating for children to practise reading from books about their own lives! I figured it had to be better than all that jumping and hopping with Jim and Bob. When owner Caroline Edwards invited me to make a sample little book, as you can imagine, that was all the encouragement I needed. You can see a demonstration of any of the books without registering, but if you decide you'd like to actually receive a finished product from love2read, you need to log in. Once that's done, choose the style of book you want, upload your photos, and finish the captions with text of your own. I chose an "I like" book, so each page had an "I like" caption under the picture. I simply looked at the photo I'd chosen, and worked out a caption to suit eg I like to read books to my toys. What I very much appreciated about love2read is the simplicity of the site. It is easy to navigate, easy to create a book, easy to purchase online. Caroline, a former teacher, has streamlined the process to make it as painless as possible. There are also lovely little details - a dedication space inside the front cover, an option to save your work and finish later, an option to change border colour. Once I'd worked out I wasn't actually supposed to put photos on the front cover, but the cover was generated from my first four photos, I was away - some Book Chooks never read directions! It took me a matter of minutes to create my book, and not much longer to proceed through the checkout process. Within a week, I received the finished product by post. I was truly delighted - it's a sturdy little book made of excellent quality glossy paper, and the clarity of the photos is excellent. Today I presented my little mate with his new book. At two-and-a-half, he's a little young for reading alone, but his face lit up when he realised that he was the star of each page, which depicted his familiar activities, toys and settings. I think the book will make a wonderful keepsake for him, and I'm sure it will make another milestone along his journey to reading. You can read Laura's review of love2read at Are We Nearly There Yet Mummy? Book Chook Alert: My Literacy Lava post is in the June Carnival of Education at Successful Teaching blog.